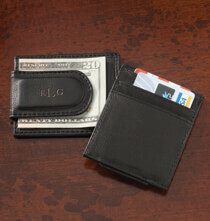 Give the men in your life a style update by replacing their old wallets with one of the high-quality, personalized men’s wallets from PersonalizedThings by Exposures. These personalized wallets for him make great gifts for your father, husband, boyfriend or brother. They’re especially good gifts for the guy who has everything. Among our esteemed collection, you’ll find an option for every personality type when you browse our selection of leather wallet styles. 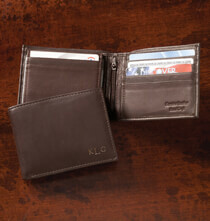 Let’s say you’re looking for a quality personalized leather wallet for him. What are your gift options? 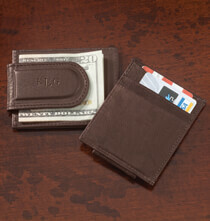 You may decide to go with a classic bi-fold style or opt for a minimalistic money clip option. We even carry personalized passport wallets for the avid traveler. Any one of these monogrammed men’s wallets would make the perfect birthday, Father’s Day or Christmas gift for him. If the man in your life has a classic style and likes to have enough room to carry plenty of cash and several cards, a bi-fold wallet may be your best gift option. Our leather monogrammed wallets feature a traditional folded style with several card slots. They also include a separate, removable clear ID holder and a zippered change compartment. The divided center leaves plenty of room for cash and receipts. Each one is made from genuine leather and is available in different colors. The gift becomes more personal with the inclusion of a custom monogram on the lower right corner of the front cover. Maybe your gift recipient prefers to carry a smaller or thinner wallet to avoid having a bulky object in his pocket at all times. If this is the case, our personalized money clips are the perfect option. 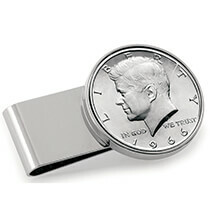 These monogrammed money clips come in several different styles. 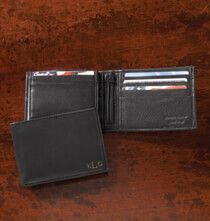 Each one is made with an attached card holder to provide enough room for both cash and credit cards. 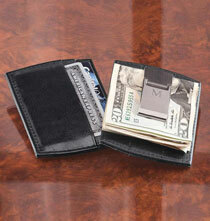 These men’s money clips are made from the same high-quality leather as our other men’s wallets. They’re also personalized with a monogram of your choosing. Another great gift option for the international travel is one of our personalized leather passport wallets. 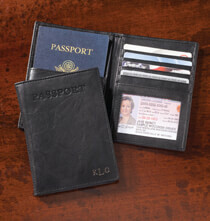 These personalized leather wallets feature a larger size with a pocket made to fit a passport. They also include room for cash, credit cards and other identification. Each one is also customized with a monogram. Once you find the best personalized leather wallet for him, browse our collection of distinctive money clips featuring historical coins such as the Walking Liberty Coin, the JFK Half-Dollar and the two-tone Presidential Half-Dollar. 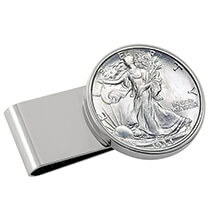 These money clip styles give him an additional option when he needs quick and convenient access to his cash.